Background:The Union environment ministry in March 2016 had notified the E-Waste Management Rules 2016 replacing the 2011 version. With this, the Indian government has taken a key step to combat this most lethal form of pollution. The earlier rules issued five years ago were quite inadequate. Organic and easily recyclable metal, glass and plastic waste need not permanently remain in landfills. But hard-to-recover substances from e-waste like mercury make their home in landfills and keep leaching into ground water. In recent years, its e-waste has grown faster than earlier anticipated. The Greenpeace study found e-waste growing at 15% annually and projected it to go up to 800,000 tonnes by 2012. But it stood at 1.7 million tonnes in 2014, the fifth highest in the world, according to a UN study. In India, e waste accounts for 4% of global e-waste and 2.5% of global GDP (2014 figures) – so it has a higher share of e-waste than its share of gross domestic product (GDP). For China, the two ratios are about the same. 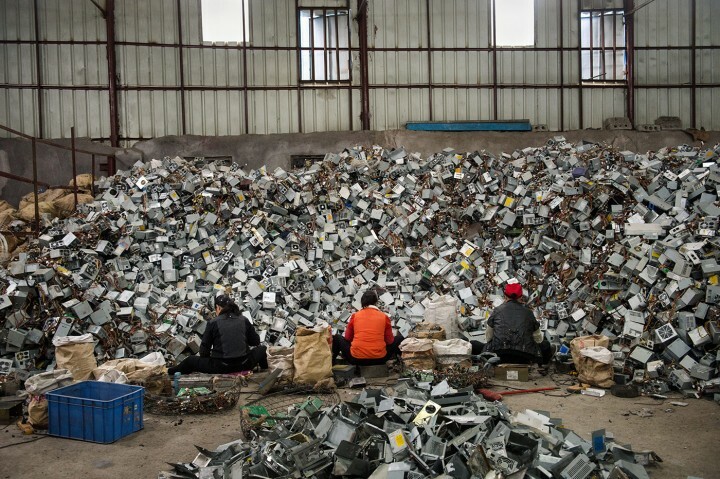 The US, on the other hand, accounts for a lower share of global e-waste than its share of GDP. According to a 2011 Rajya Sabha secretariat study, e-waste accounts for 70% of Indian landfills. The new rules have included things like discarded CFL (compact fluorescent lamp) light bulbs which contain mercury. The new rules have brought producers of electronic goods under “extended producer responsibility”, making them liable for collection and exchange of e-waste with targets. Producers’ obligation to take care of e-waste will go up from 30% in the first year to 70% in the seventh year. To make procedures easier to follow, the new rules require players in the e-waste life cycle to register with just the Central Pollution Control Board and not have to go through individual state pollution control boards. A big responsibility also has been placed on the shoulders of state governments. It is their job to adequately train and protect the health of workers engaged in recycling. Why it is difficult to manage e waste in India? Customer care representatives do not have inkling about any take back or recycling programme and even if they have set up collection centres, they are simply not enough for a geographically vast country like India.India being a vast country, setting up collection mechanism is a big challenge. If any of the brands try individually to reach out to all corners of the country, it will economically not be sustainable or feasible. Developing countries with rapidly growing economies handle e-waste from developed countries, and from their own internal consumers. Though India’s ministry of environment and forest has made import of e-waste illegal, a fair amount of e-waste is still illegally imported into India. Currently, majority of e-waste handled in India is through informal sector using rudimentary practices. Also, these chemicals are not biodegradable. As per a WHO study, children are especially vulnerable to the health risks that may result from e-waste exposure and, therefore, need specific protection. As they are still growing, children’s intake of air, water and food in proportion to their weight is significantly increased compared with adults, and with that, the risk of hazardous chemical absorption. In India, “about 4-5 lakh children in the age group of 10-15 are observed to be engaged in various e-waste activities, without adequate protection and safeguards in various yards and recycling workshops. On the positive side e-waste contains many valuable materials like rare metals, which are well worth recovering, provided one uses green technologies. Just as green power entered electricity generation as a business, e-waste disposal can be a business: this has been demonstrated by companies like Attero. The threat of generating e-waste should not diminish our national ambitions in digitizing the country and e-enabling the citizens. Along with digitalization plans, our nation needs a matching e-waste plan to contain the e-mess, an advance type of planning rather than a post-facto approach. The first big step is to recognize that the e-waste monster is being created right now. Besides, manufacturing processes in India have to adopt better technology so as to generate less waste. India has a lot to learn from Norway in this matter. Norway has e-waste take back system in place for more than a decade now, whereas, India notified these rules very recently. When the e-waste rules were introduced in Norway, the country faced similar questions. The authorities were finding it extremely difficult to enforce and follow up so many entities producing and importing electronics in the country. The deliberations conceptualized the idea of EPR which culminated in e-waste regulation. Like the rules in India, management of e-waste in Norway is also a producer responsibility and producers are defined as Norwegian manufacturers and importers of EEE. The producers/importers of e-waste in Norway are obliged to be members of a take-back company and have to pay a fee for their membership to the take-back companies. This is how it provides the funding for collection and treatment of the waste. The take back companies in Norway need to get an approval from the Norwegian Environment Agency. The approval process includes a verification of nearly about 50 criterions besides third party having to certify them. The process includes providing a plan detailing how they will collect e-waste and treat it in an environmentally sound way. They also need to ensure that they will collect all e-waste from their market share which is determined by how much of electronics is put into the market by their members. The take back companies report back to Waste Electrical and Electronic Equipment (WEEE) register, which is managed by the government, and also finance WEEE register. In contrast, India does not have any data on the electronics being manufactured and imported in the country. There is no national registry taking account of the producers operating in the country and the amount of EEE introduced by them in the market. Huge amount of recycling and recovery of e-waste in Norway has only been possible due to the presence of efficient take back system and the collective interest of the producers to comply with the legislations. In a stark contrast, the formal collection mechanisms in India are able to capture only five per cent of the end of life EEE and a huge chunk lands in the informal sector putting a question mark on the recycling and recovery of e-waste. In order to tackle the issue of e-waste handling and management in an effective and meaningful manner, the government may consider the desirability of bringing a separate legislation on e-waste instead of handling it under the Environment Protection Act. Such legislation may call for establishing a central authority or a central public sector undertaking having experts from IT field and other technical domains possessing knowledge of e-waste disposal, management and recycling techniques and its own e-waste collection centre/ recycling plants with state-of-art technologies, in all major cities of the country. The law should make it mandatory that the e-waste generated from various government departments all over the country as well as by entities and individuals, big or small industrial houses, educational institutions shall be deposited at the designated collection centres.